Beat until fluffy then mix dry ingredients together and add to mixture. Spread in a sheet cake pan. Bake at 350 for 20-25 minutes. Make sure your cream cheese and butter aren't too cold so your frosting doesn't get chunky. Cream butter and cream cheese together. Add vanilla and gradually beat in powdered sugar. Spread on cooled cake. Enjoy! We found this great recipe from one of our favorite blogs, Our Best Bites Blog. 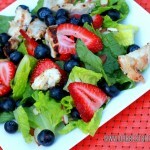 This salad is so light and easy to put together and would be a great addition to your July BBQ. For serving a large crowd, toss all the salad ingredients in a large serving bowl and add dressing to taste. For individual servings, arrange ingredients on plates and serve the dressing on the side. Makes about 8 side dish servings and 4 main dish servings. Here is a delicious spring salad that would be a great part of any Easter Dinner. Mix first 4 ingredients together (dressing) and set aside. Put spinach in large bowl, add celery and green onions – mix together. Drain juice from oranges and then pour oranges over salad. Add dressing and candied almonds – mix well. Stir over low heat until well coated. Grease foil or parchment paper and pour over it. Pat the nuts down so they aren’t so bunched up. Allow to cool and then separate. Your new dream home awaits.